At first, everyone thought it was a joke. Wouldn’t you, if a famous singer contacted you? The star is Joss Stone, the acclaimed chart-topping British singer who’s currently playing to sellout crowds on an extensive world tour. Stone’s assistant reached out to ELI in Chile, saying Stone would be performing in Santiago in March and wanted to visit a local non-profit. Once she got over her shock, Paola Vilaxa, ELI’s coordinator in Chile, knew just the place to recommend. Vilaxa knew that recognition by a performer of Joss Stone’s stature would mean priceless exposure for the group, and was thrilled -- if somewhat still dazed -- when Stone expressed her enthusiasm. But Joss Stone is no ordinary celebrity. To give her a sense of what they do, therapists had Stone get on a horse and do a series of exercises to demonstrate how muscles respond during horseback riding. Stone’s visit made the kids feel important, and the volunteers feel appreciated, Paola says. Local media was on hand during Stone’s appearance, doing exactly what both women intended: helping to publicize important work being done by dedicated staffers who do it with no pay and little glory. The promotion worked. Since the singer’s visit, more prospective clients are calling, fundraising will be easier, and there may even be a documentary made about the group’s efforts. 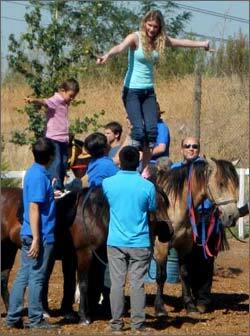 Click here for more about ELI’s horse therapy program and other volunteer opportunities in Chile.